Talking in detail about the F-35 Joint Strike Fighter requires verbal dexterity. Many of the aircraft’s features are classified, so inadvertently revealing a number or the full capabilities of a sensor carry a heavy price. “Leavenworth [prison] is such a terrible place to be,” Stephen O’Bryan says with a rueful smile as he pauses yet again at the description of a sensor system. The vice president of F-35 Program Integration and Business Development for Lockheed Martin Aeronautics is treading carefully for good reason. 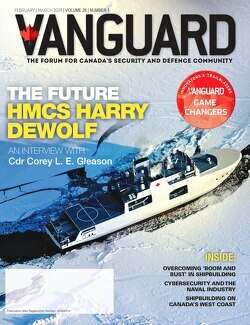 He needs to continue selling the virtues of the aircraft to Canadians, especially Cabinet members who now hold the fate of Canada’s CF-18 fighter replacement program in their hands following the delivery of an options analysis report by the National Fighter Procurement Secretariat in April. But he wants them to understand the generational leap in technology he believes the F-35 represents without revealing the full extent of its capability. A former U.S. Navy fighter pilot with years of experience in F-18s, O’Bryan knows the limitations of so-called fourth generation fighter jets. Where survival was once about the skill of a pilot, it will now be about the strength of the data. “We used to say speed is life; it’s now, information is life,” he says. Rather than a technician in the cockpit, O’Bryan envisions a tactician making rapid decisions based on the automatic fusion of data from thousands of sensors. “Fourth generation flying was hard. The best fighter pilots I knew where the ones who [could process what they heard over their radios] and meld it with what they were looking at in their displays. That made it more art than science. He equates the introduction of the F-35 to the arrival of the aircraft carrier and its impact on the notion of close engagement in naval warfare. The fighter jet’s array of sensors, database and processor allow it to operate from distance to degrade and then attack an opponent’s capability. To demonstrate why the F-35 is a self-sufficient game-changer, able to operate without the support of electronic attack, airborne warning and control, or joint surveillance and target attack aircraft, he points to the AESA (active electronically scanned array) radar. For starters, the F-35’s APG 81 radar is no longer just a radar. “It’s a multi-functional array” that automatically fuses information from “thousands of radars” in the aircraft, O’Bryan explains. And rather than the familiar sweeping cone, the F-35’s beam is more like a laser, able to focus on a specific target or on multiple targets (the exact number is classified) with ten times the power of an EA 6B Prowler, he says. Furthermore, a formation of four F-35s can alternate transmission of the jamming signal among themselves, again automatically. And with stealth capability, one or all four of the aircraft can operate from inside the target’s firing range. Equally important, where fourth generation radar are able to detect the arrival of a threat with plus or minus 30 degrees accuracy, the F-35 can pinpoint the threat to within plus or minus one degree, an advantage that is narrowed further with the assistance of a formation of four aircraft sharing that threat trajectory, he says. The rest of the electronic warfare (EW) systems, the distributed aperture system (DAS) and the electro-optical targeting system (EOTS) are equally impressive. The six cameras that make up the DAS provide 360-degree situational awareness and missile detection and tracking that is able to identify which aircraft in a formation has been targeted and then triangulate the location from where the missile was fired. “DAS is turning out to be better than we thought,” O’ Bryan says. And the EOTS underneath the nose of the aircraft provides laser guided bomb targeting, including locking onto moving targets, infrared search and track (IRST), blue-force interrogation, non-cooperative target recognition (CTR) and radar frequency counter measures (RFCM), which allow the F-35 to identify an adversary by the return of its engines and emissions. “It has the best combat ID suite of any fighter I have ever come across,” he says. “And it has the most advanced suite of countermeasures of any fighter airplane.” In addition, he points out that the F-35 carries 18,500 pounds of onboard fuel, meaning it can stay in the fight longer than its fourth generation counterparts. That range of capability – operating at distance, onboard electronic warfare, target identification, common situational awareness, and the ability to engage for longer duration – suggests a change in tactics. O’Bryan says young pilots entering the F-35 program are already starting to think of new ways of operating. “They are getting very innovative. I have seen them in the simulator do things that I have learned from, things to create deception and surprise.” But that, too, will remain classified. Is Lockheed Martin’s C-130 on a flight path towards 100 years of service?